First, understand that you can’t control everything. The world is full of question marks, and it’s your job to deal with them as best as you can. First-year analysts for a big invest bank might think they have control over the NYSE, but truly, they know there is nothing they can do to make a stock go up or down. What they do know however is that they have trained day and night for months with their co-workers and are poised to deal with any and all hardships that comes their way. The executive chef for a world-famous restaurant has no idea what his customers will think of his food, for every person has different taste buds. That chef can’t control what consumers will say, but he probably washes his hands the same way every time before cooking the best dish many have ever tasted. Without routine, his food would be nothing. Second, don’t let others stray you away from your routine. 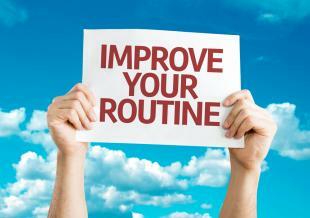 Your routine is yours, and yours only. Rafael Nadal is a fourteen-time grand slam champion, and considered to be one of the best professional tennis players to ever live. Nadal is famous for many things, his routine among the most notorious. If ever you watch this man play you will see his infamous sequence of events after every point.As he lines up to serve, Nadal uses his right hand to tuck his hair behind his ears. First the right-side, then the left. Once completed, he takes his thumb and pointer fight to itch his nose. Finally, his most talked-about habit: he grabs his shorts and pulls them as if he has a wedgy. Many commentators and players talk of his famous routine, teasing him and mocking him. To Nadal, the words simply go in one ear and out the other. The bizarre routine can be laughed at, but Nadal has won the French Open more than any man or woman alive, and continues to punish his opponents on court everyday. You can laugh, you can doubt, but there is no question that those with a disciplined routine find ways to win. They control what they can, prepare for the worst, but expect the best.